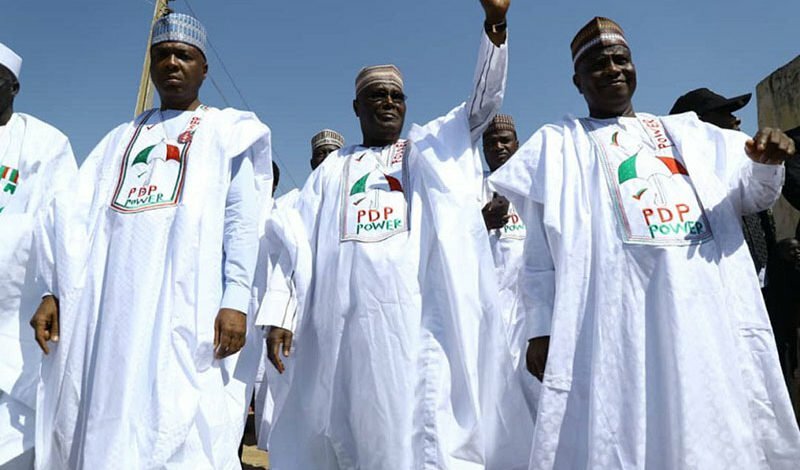 The Peoples Democratic Party (PDP) presidential campaign kicked off yesterday in Sokoto, with the leading opposition party promising to rescue Nigeria from President Buhari and the APC-inflicted poverty and hunger. Chieftains of the opposition party, including former President Goodluck Jonathan, Senate President Bukola Saraki, House of Reps Speaker Yakubu Dogara, former Jigawa State Governor Sule Lamido, Senator Rabiu Kwankwaso and others were at the rally. they took turns to list what they described as the many failures of the APC and concluded that the PDP was on a rescue mission. The PDP presidential candidate, Atiku Abubakar said he's coming to end hunger. PDP chairman, Uche Secondus said that President Buhari and the APC had failed the people “woefully” and that the APC-led administration cannot rig the election with security operatives. According to him, the PDP has chosen a credible and experienced candidate in former Vice President Atiku Abuabakar and his running mate, Peter Obi, to lead the rescue mission. 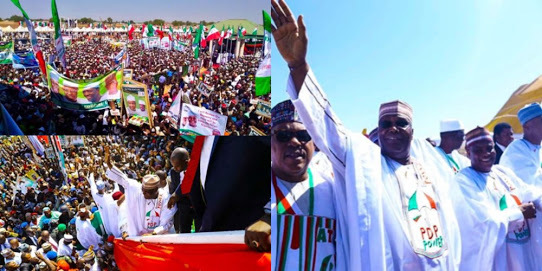 Secondus, who doubles as the chairman of the PDP Presidential Campaign Council, said the performance records of the duo of Atiku and Obi reassured that Nigerians will be in good hands after next year’s election. “Atiku has what it takes to turn the economy around, create jobs for our teeming youths and unite the country,” Secondus said, claiming that Nigerians had turned their back on the APC-led administration. The PDP chair cautioned the Independent National Electoral Commission (INEC) and the security agencies not to undermine the country by attempting to rig the elections. Former President Goodluck Jonathan said Atiku and Obi would show Nigeria the way forward and urged the people of the Northwest to join the PDP in showing the way forward. Jonathan said: “From 1999 till date, we have seen four presidents – from Obasanjo to Umaru Musa Yar ‘Adua, to myself and the current President (Buhari). You have seen how the various presidents and the various parties have worked, and one thing is very clear, PDP is still the number one party. “There is something that all of us see as human beings. Everybody, everyday must eat; and if you cannot eat well, then you are not happy. PDP is the only party that can make sure that all of us eat very well in the morning, in the afternoon and in the evening. “Let us not make mistakes, those of us who are adults, old enough to vote, if we vote wrongly, our children and grandchildren will not forgive us. “Today, our country has a lot of challenges and we have looked at all the presidential candidates; all of them are good people. We have known them, credible people, but among all, we have seen that it’s only Atiku that can deliver. “If you have a football match, you go with your first eleven, you don’t manage. If you have a wrestling or boxing tournament, you go with your best. You don’t manage. Saraki, who is the Director-General of the Campaign, urged the people of the Northwest to lead the way in what he described as the mission to rescue Nigeria. Declaring the Northwest a PDP zone, Saraki bemoaned the deteriorating socio economic situation in the country, saying: “There is no security, there is no food, there is hunger. Dogara said Nigerians should be grateful for democracy that provides them the opportunity to make changes whenever things go wrong. He said he and some other Nigerians fought for change in 2015, but had since realised that the change was not forthcoming, hence his decision and others to dump the APC for PDP. Dogara said: “Democracy always offers us the opportunity to correct ourselves. We had speeches dealing with our convictions in 2015 when some of us left PDP to say we wanted to associate with change. “So, we have a wonderful opportunity today to revisit those issues of 2015. We will be deceiving you to say that this election is between Atiku Abubakar and President Muhammadu Buhari. “The election is not between them. The election is about you, women, young people and every Nigerian citizen who is suffering untold hardship today on account of lack of good leadership. “So, we want to review a lot of things. For instance, is your life better now than in 2015? Is security better now than it was in 2015? Are we more united as Nigerians than we were in 2015?